Let This Classic Midwest Cadillac Work Its Magic On You. 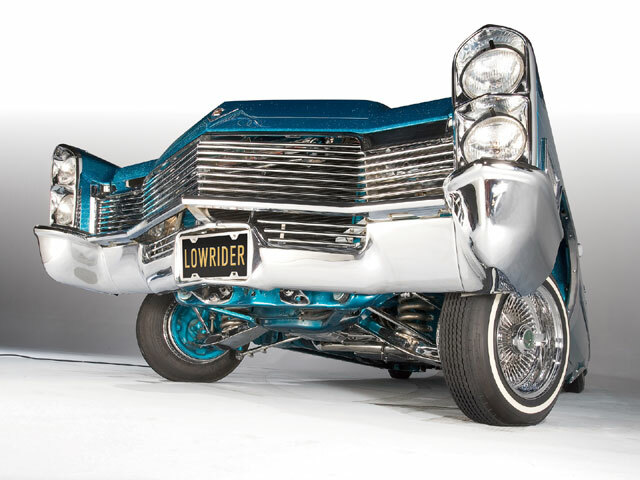 Anyone who reads this publication regularly, or who caught our recent Readers’ Rides special, can tell you that the Midwest lowrider scene is blowing up. The culture’s currently experiencing its fastest growing market in cities and towns stretching from Illinois and Indiana through to Ohio and Michigan, and dipping down into Kentucky. Actually, thanks to a few dedicated clubs, individuals and businesses, custom car builders have been rolling low in the “Blue Grass State” for a while now. Sean Rosser of Mt. Washington, Kentucky, has been into cruising, scraping, bumping bass and hitting switches for years. 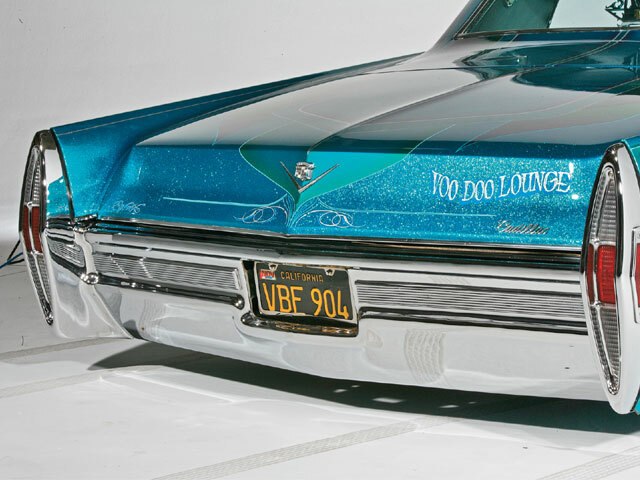 His ’68 Cadillac Coupe DeVille, “Voodoo Lounge,” is the culmination of his lowrider career (so far). 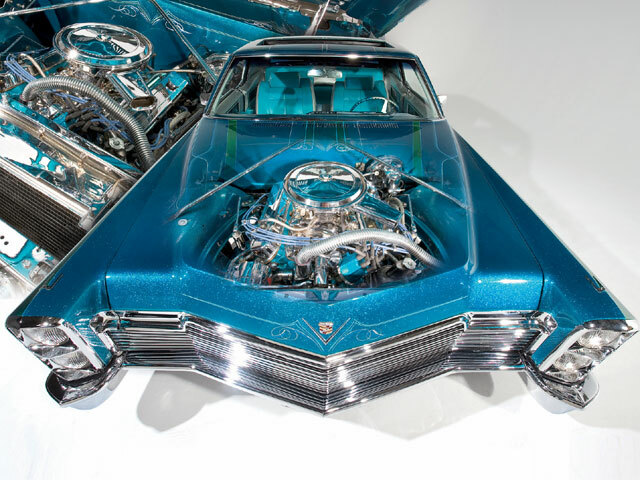 From top (44-inch moonroof) to bottom (full-chrome undercarriage), and from front (custom one-off grille) to rear (Pro Hopper hydraulics setup in the trunk), this Caddy’s a more than worthy candidate for cover consideration, which was Sean’s goal from the beginning. And yet, when we told Sean of his car’s selection for our March cover, he was a little humbled that someone “who lives in the Midwest” could pull off “the rare feat” of a Lowrider cover. Sean, let’s just say that your Voodoo Lounge worked its magic on everyone who’s come in contact with the car. 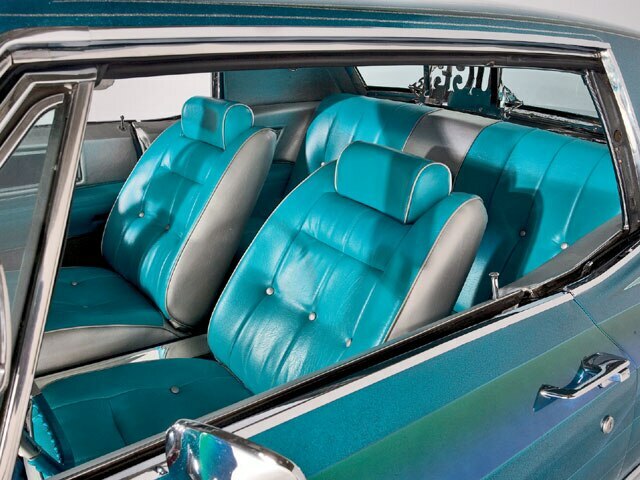 We were first transfixed by the tri-tone (teal, blue and green) metalflake finish. We soon discovered that there was much more to hold our attention as the well-done modifications on this devilishly delightful Coupe DeVille go way more than just skin deep. 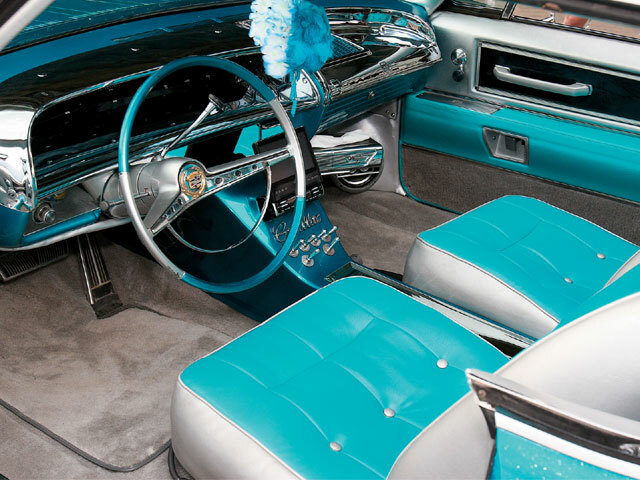 Another thing in the car’s favor is the fact that it’s a ’68 Cadillac, a car that you just don’t see every day, either on the streets or in Lowrider. Hey, Sean, where’d you pick up such a classic example of American steel? “This car was acquired through fellow club member (Uce C.C.) “Porky,” in Lexington, Kentucky,” he says. It sure is nice to have friends. Speaking of friends, Sean thanks everyone who helped him make Voodoo Lounge such a potent piece of machinery, including all of those mentioned in the Tech Specs, plus his wife (and co-owner) Lisa (who got involved by sanding down the chassis among other things), their kids Paige and Jared, John Nichols, the Granvilles, Brad and Curtis Pivot, Courtney, Mike, Eric, James and everyone else who had a hand in the project. Sean also credits our own Saul Vargas (who co-photographed this feature) for coming up with the car’s name, along with other “creative ideas.” You know that Saul’s always down for helping out on a worthwhile project if he can, and spreading the lowrider love across this great land. The “voodoo” theme has taken on a life of its own. Sean tells us that a “ghost face” can be seen in several photographs that he’s taken of the car. A haunted Cadillac? Maybe it’s the car’s original owner coming back to express his approval of the Coupe DeVille’s latest incarnation. Voodoo LoungeOwner: Sean and Lisa RosserVehicle: ’68 Cadillac Coupe DeVilleCity/State: Mt. Washington, KYClub: Uce C.C. Engine/Drivetrain: “Motor Mike” Charlet and “Lincoln James” Cockeril of Louisville, Kentucky, (“two of the best gearheads in the business,” Sean says) teamed up on the 472-c.i.d. engine build. 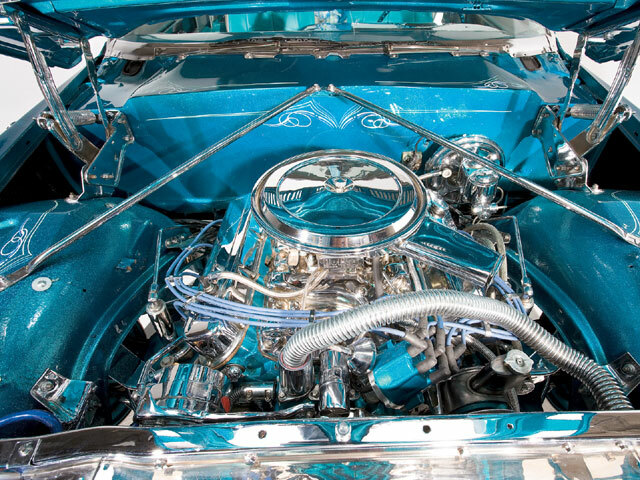 The candy-painted block is joined by a 400 Turbo transmission and all-chrome Flowmaster exhaust system. Larry at Blakely’s Polishing in Dayton, Ohio, was the go-to guy for the show-quality chrome plating found all over the car. 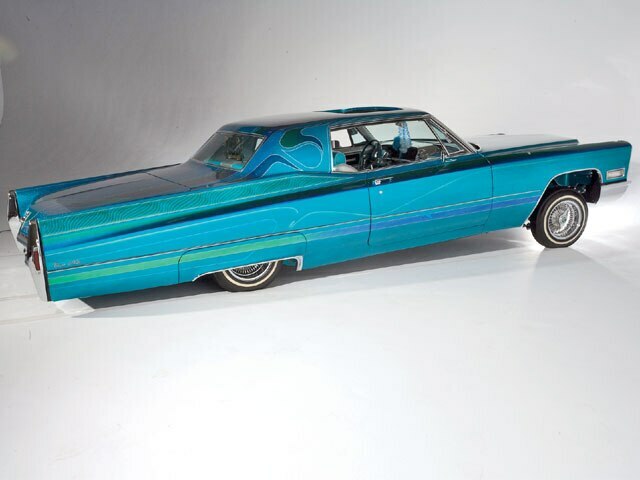 Body/Paint: Body mods on the too cool coupe include a 44-inch moonroof cut out by “Big Doe” and a custom grille put in by Jason “Blinky” Grimes at the Garage Custom Rod Shop in Louisville. Jesse, Keenan, Robbie and “Uncle Harold” Granville at G&S in Lexington, Kentucky, applied the “wet” teal, blue and green finish using House of Kolor candy and flake paint. Sean was looking for a paint job in the style of Lifestyle Car Club of Los Angeles, California, and he got it. Enhancing the graphic exterior is pinstriping from Kirby of Danville, Kentucky. A mural of “Poseidon overturning ships” found on the underside of the gas tank was put down (or is it up?) by Kent Hansford of B&K Customs in Louisville. Interior: The “Lounge” interior was reworked by both Chris Walls of DeVille Upholstery and Dale Washington at Staple & Stitch in Lexington to include color-matching bucket seats taken from a ’96 Chevy Impala SS and a custom center console. Jesse at G&S got into the act by installing a ’63 Impala dash retrofitted with Dakota Digital gauges that, according to Sean, people sometimes overlook at first because it was executed so seamlessly. John Arnold put his woodworking skills to the test by adding fully upholstered panels in the trunk, along with some neon lighting. Sound System: Chris Newton at Night Crawler Customs in Lexington installed a Clarion head unit, 7-inch TV, two Rockford Fosgate 600-series amps and a range of speakers culminating with a pair of 10-inch subwoofers. All of the components were furnished by Smart Shoppers of Louisville. Setup: Putting the moves in the “Voodoo” cruiser is a two-pump Pro Hopper setup dropped in by Jason Caranto of Louisville that includes three Adex dumps, 8-inch (front) and 10-inch (rear) cylinders, 5-ton (front) and 1-ton (rear) springs, four switches, six solenoids and six batteries. Jason also reinforced the stress points on the chassis, extended the A-arms and shortened the rearend.